HILLSBORO, OR--(Marketwired - Jul 21, 2014) - Lattice Semiconductor Corp. (NASDAQ: LSCC) is delivering unprecedented performance in ultra-low power, small form factor, customizable solutions with the newest member of its new ECP5™ family, the LFE5UM-85, available today along with the Lattice Diamond® design tool, development boards, soft IP library, reference designs and hardware demonstrations. Targeting high-volume small-cell, microserver, broadband access and video applications, ECP5 FPGAs have twice the functional density of competing devices in a tiny 10x10mm package, and come in at 40% less cost and 30% less power compared to other options. The new 85K LUT (look up table) LFE5UM-85 devices sampling now, are the largest in the family and available in the same packages as smaller devices in the family -- which enables designers to prototype in the largest device size for convenience and flexibility, then optimize for cost in a lower density device when they go to production. The ECP5 hardware development boards based on the LFE5UM-85 will be available for purchase at www.latticesemi.com by end of July. 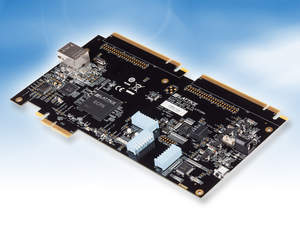 Over 100 early access customers are using ECP5 devices and boards to build solutions that perform critical bridging and interface functions including LPDDR3, PCI Express, MIPI, Ethernet, and USB3.0. "Customers are fully enabled to implement their ECP5 designs quickly and also easily meet their need for high-performance and flexibility," said Lattice Senior Product Marketing Director Jim Tavacoli. Lattice Semiconductor (NASDAQ: LSCC) is the world's leading provider of ultra-low-power, small form factor customizable solutions for makers of smartphones, mobile handheld devices, small-cell networking equipment, industrial control, automotive infotainment, and much more. With more than 1 billion units sold in the past 10 years, Lattice ships more FPGAs, CPLDs and Power Management solutions than any other programmable solutions vendor. For more information, visit www.latticesemi.com. You can also follow us via Twitter, Facebook, or RSS. Lattice Semiconductor Corporation, Lattice Semiconductor (& design), L (& design), ECP5, Lattice Diamond, and specific product designations are either registered trademarks or trademarks of Lattice Semiconductor Corporation or its subsidiaries in the United States and/or other countries.